Traveling here or abroad? You can make a big difference! Current Situation: The dunal forest on the Key (island) is being almost completely destroyed by construction of hotels, shops and restaurants for tourists who come mainly from the U.S.
Why this is a bummer? 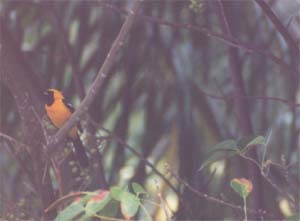 Being almost completely lost is not only a beautiful forest, but habitat for endemic species such as the Black Catbird, a striking songbird with a great personality, and for many birds such as Baltimore Orioles, Rose Breasted Grosbeaks, Warblers & others that summer in North America. There is a simple, easy, solution that involves no cost to taxpayers, Belizean or American: US. Tourists should quit patronizing establishments that install landscaping and palm trees, and only patronize hotels, (and ultimately other businesses) that leave the original dunal forest or a restored dunal forest on their grounds. 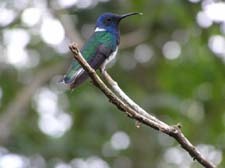 A Hotel that does this on Ambergris is Carribean Villa Resorts (phone # coming) Even though the amount of forest they have saved is small, it is enough for a resident population of Black Catbirds. In just three days Delia & I saw 48 species of birds on the half-acre or so that they have preserved. If all the hotels and businesses were to value and preserve the dunal forest on the parts of the property that weren’t occupied by drive ways and buildings, the problem would be significantly ameliorated, but before they will do this, they have to hear, through their cash registers, the signal that people care about this and want them to. 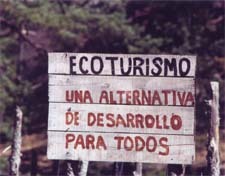 All around the world, tourism is degenerating the environment. But tourism is also playing a big role in saving the environment, and it can play this role more strongly in the future. Before planning a trip, find out if you can patronize hotels and other businesses or private preserves that save habitat, and refuse to patronize, where possible, hotels and other businesses that rip out rare and beautiful native flora in order to install such anti-amenities like grass lawn and (non-native) palm trees. 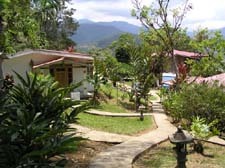 This is Rancho Naturalista in Costa Rica, just one of many possible ecotourism hotels that could be incorporated into a vacation. number coming soon.